Software companies with photo- or video-based products are all going gaga for filters these days, with video-sharing site Vimeo the latest to roll out a (huge) range of filters to help beautify your work, or in some cases, leave it looking horribly over-cooked. Vimeo has partnered with video-enhancer start-up Vivoom to bring web-based users of its site more than 700 filters – no, that’s not a typo. Seven hundred. 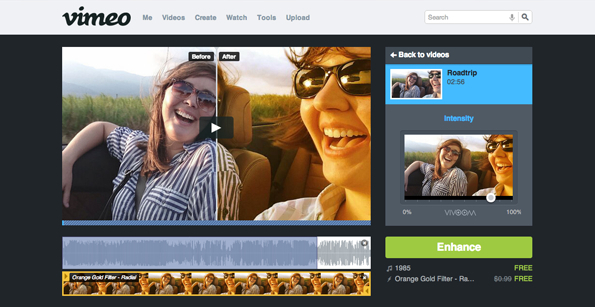 Called ‘Looks’, the feature offers a split-screen enabling you to compare your original video with the filtered look. Find something you like, preview it, tweak the strength of the effect with the ‘intensity’ slider, click ‘enhance’ and you’re done. There are 61 pages of filters to work your way through – 12 per page – so enhancing your video might end up taking hours, days or even weeks if you’re the type of person that likes to explore all available options. While some filters appear to offer very subtle alterations (eg. Fresh, CSI), others completely transform the image (DNA Transcription, Awesome Possum), though if used with the intensity slider they could offer some neat effects to help your video stand out. However, though Looks may offer many video uploaders a chance to quickly jazz up their clip, it’s a safe bet serious video makers will stick with their current image enhancing tools without giving the new feature a second look. Vimeo’s filters are free to use for the next three months (so plenty of time to find your favorites) after which time they’ll be available for 99 cents each. 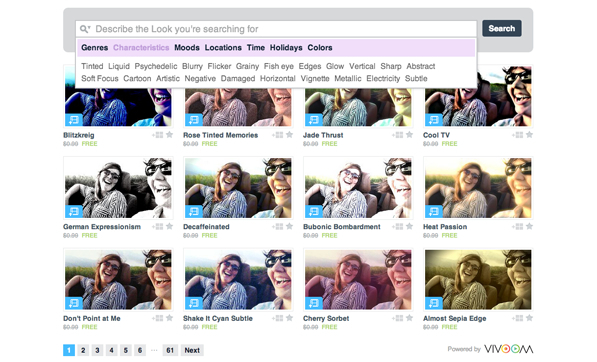 The filters are not part of its mobile app, though we can expect to see them incorporated at some point down the road. One month later, how are video apps faring in the face of Vine?